At the meeting in Newcastle were Jean Hughes, tenant, Down District Councillor Carmel O’Boyle, Chris Hanna, Apex Property Service Officer, PSNI Constable Davey Jones, Anne Russell , Tenant, David Pratt, Apex Housing officer, Neighbourhood Policing Sgt Jim McIlveen, Paula Nixon, Newcastle Interagency Group, Sister Teresa Clancy and Linda Boyle, Murlough Community Association. THE Burren Meadow Residents in Newcastle have attended an induction event with Apex Housing Association. On Wednesday 30 January, this historic historic meeting was held in The Newcastle Centre. The first tranche of 18 tenants who are about to take up residency in Newcastle’s newest housing development, took part in an induction session. There are 130 houses in the first phase of this development and yesterday the first 18 tenants attended an induction session with Apex and some of the rest of us – to help them get to know about their new tenancies and to find out what help is available from us. A further 11 new tenants also underwent the same induction. Over the coming months, similar sessions will be held at intervals of two weeks, in order to acquaint the new residents with all they need to know about their new homes and their new development. 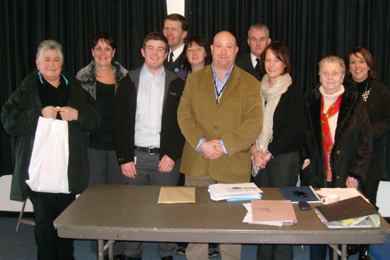 As well as the new tenants, the meeting was attended by Paula Nixon of the Newcastle Interagency Group, Sister Teresa and Linda Boyle from the Murlough Community Association, Councillor Carmel O’Boyle and PSNI officers Sgt Jim McIlveen and Constable Davey Jones. The meeting was organised by Apex Housing Association’s David Pratt, Housing Officer and Chris Hanna, Property Service Officer, both of whom made presentations to the audience. Paula Nixon presented the new tenants with Welcome Packs on behalf of Newcastle Interagency Group and these contained all the information the new residents could possibly need. After the meeting, Councillor Carmel O’Boyle said: “This was such a happy occasion for everyone present and the information given to the new residents will have done much to allay any concerns they may have had. The first new tenants will take ownership from early in February and the remaining homes will be released on a steady and phased basis. I think that the new tenants of Burren Meadow can be in no doubt that there will be ongoing support for them from all of us.